UNITED NATIONS, December 17. /TASS/. 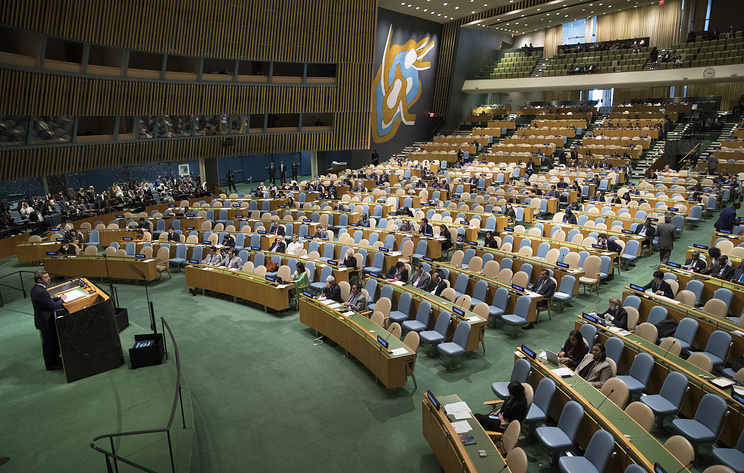 The United Nations General Assembly on Monday passed a Russia-initiated draft resolution on combating glorification of Nazism, neo-Nazism and other practices that contribute to fueling contemporary forms of racism, racial discrimination, xenophobia and related intolerance. The document was supported by 129 nations. Fifty-four abstained and two - the United States and Ukraine - voted against. The 66-provision document expresses "deep concern about the glorification, in any form, of the Nazi movement, neo-Nazism and former members of the Waffen SS organization, including by erecting monuments and memorials and holding public demonstrations in the name of the glorification of the Nazi past, the Nazi movement and neo-Nazism." The UN General Assembly "calls for the universal ratification and effective implementation of the International Convention on the Elimination of All Forms of Racial Discrimination" and encourages states to eliminate all forms of racial discrimination by all appropriate means, including legislation.